Pyle was nearly the village that became the new Borough of Kenfig. Although in the Tudor period the inhabitants styled themselves ‘townsmen’, and appointed Ale tasters in anticipation that the transfer might still happen, it never did, and eventually the population resigned themselves to being just another village on the road from Cardiff to Swansea. The one lasting and tangible memorial to these early high hopes is the village church. Unlike most medieval communities this was set away from the heart of the village around the crossroads where the main coastal highway crossed the more ancient one leading from Kenfig to Cefn Cribwr and on to Aberkenfig.This was probably because the area about the cross was left for the commercial heart of the proposed new town – the market square, the town hall, and the business premises of the major burgesses. Erected as the new parish church, it was dedicated to St James as had been its predecessor in the abandoned town at Kenfig. The latter was demolished, and much of the material sent to Pyle to be incorporated in the new building. A blocked-up priest’s door on the south side of the chancel is one such element, but another legacy of this transfer is best seen on the outside of the south wall of the nave. Here, contrary to normal building practice, the largest stones are at the top and the smallest at the bottom, so it is in effect an “up-side-down” wall! The reason for this is that as the demolition teams worked on the old ruined walls of St James at Kenfig, they naturally started from the top. These smaller stones were therefore the earliest materials received by the masons at Pyle. Later, when the workers at Kenfig began reaching the footings, the larger stones began arriving, and the Pyle team had no option but to utilise them on top of the walls they’d already built! The surviving Kenfig burgesses bitterly opposed the construction of this new church, no doubt claiming that the one at Maudlam was older, stood within the enlarged boundary of the Borough, and should therefore be accorded the status of being the parish church. This dispute reached a climax in 1485 when the people of Pyle actually took the Burgesses to court, and obtained an order forcing them to acknowledge the status of the new church. Despite this, the dispute rumbled on for centuries and in 1810 a Vicar of the parish who just happened to be a burgess, and who several times held the office of Portreeve, claimed that Maudlam was his parish church and Pyle merely its chapel of ease! Although Pyle never achieved the status of a Borough, because of its location on what was now the main highway along the South Wales coast, it quickly became the most important of the local villages. 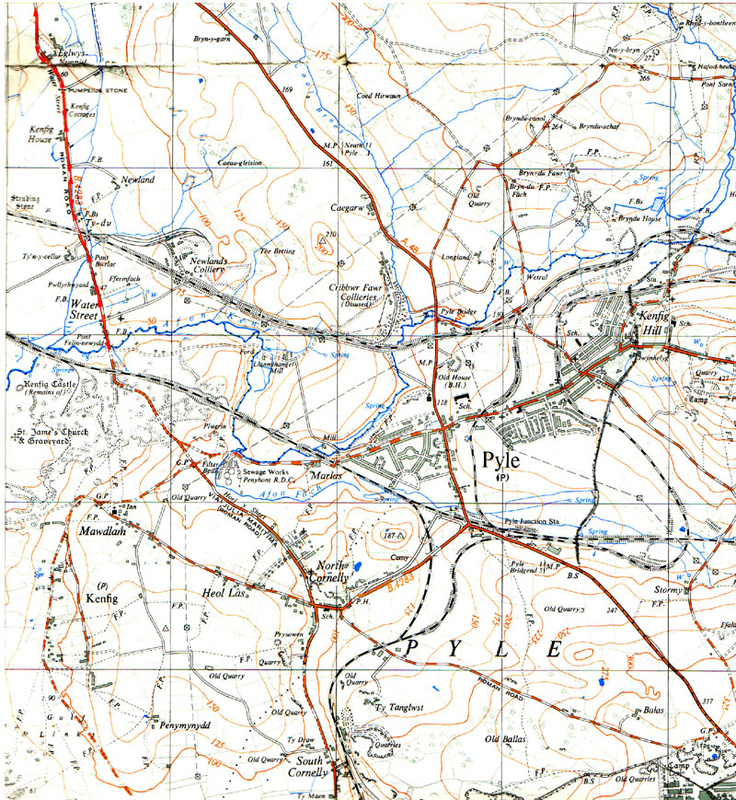 Until the early part of the 19th century this highway ran through Ewenny, completely by-passing Bridgend, so the village stood roughly half way between the major towns of Cardiff and Swansea. Consequently it became a useful overnight stopping place for travellers, and several ale houses sprang up in the village to cater for this traffic.The most important of these was Ye Olde Wine House (known universally as ‘The Tap’) opposite the church, which was built by the Margam estate towards the end of the 17th century. Such was the subsequent growth in road traffic during the century which followed however, that its rather limited facilities could no longer cope. Consequently a larger, purpose-built premises called Pyle Inn, was erected nearby about 1789. It became one of the great coaching inns of Wales, being not only an important staging post on the South Wales highroad, but also a convenient centre for meetings of local government officers for the County of Glamorgan. Its end came with the arrival of the railroad in 1850, and although the premises lingered on for a while after, it finally closed its doors in 1886 and was subsequently converted into flats. Sadly this historic old building was demolished in 1959, and no trace of it now remains. The Tap is nevertheless still with us, and still catering to the needs of the local population and the passing trade alike.